As we enter 2014 I have a sense of expectancy and anticipation for all of those who follow the Way of Christ. We can expect challenges, roadblocks, attacks and attempts to deceive us. However it is our following Him, being led by the Spirit, and being attentive to the formation of the character of God as well as the charisma of God, that brings victory in ALL circumstances. Whether this is in the natural circumstances of living in a fallen world or in supernatural circumstances manipulated by the enemy of our soul, we are triumphant! As we follow, He always leads us in a triumphal procession (2 Cor. 2:14). This is a greatly encouraging Word as we move into the new year. On New Year’s Eve our church engaged in an evening of worship and prayer to close out 2013 and enter into 2014. During our time of interaction with the Lord He revealed to us that 2014 would be a ‘year of contrast’. There will be contrast, clear distinction, between those who follow Him and those who do not. This word implied a following that was active not passive. We often assume that ‘followers’ are all believers, but clearly not all believers are followers. Many are passive, disengaged, and semi-retired in their spiritual walk. They are passive in the body of Christ, His church as well. Therefore, the Lord is saying a clarifying contrast will become apparent in the coming year. I don’t know how far beyond our local fellowship this word may apply, but our apostolic mantle would indicate a significant application beyond our local church, Crossfire. The Holy Spirit also indicated that the year would include a ‘greater manifestation of His majesty’. ‘Majesty’ is defined as ‘exalted dignity, grandeur, royalty and stateliness’. This term is usually associated with kings and royalty. We are citizens of a kingdom without end and without natural dimension. To experience a greater manifestation of His majesty would be to live, walk and worship at levels we have yet to enter. To experience His majesty would be to testify to the evidence of His Word above the evidence of circumstances. I encourage you to seek His majesty and embrace His royal role in your kingdom walk. Finally, the Holy Spirit brought forth a ‘vision of a white owl’ sitting upon the landscape. A white owl in nature is the snowy owl that migrates south from the Arctic to the northern prairies of America to spend the winter in snow covered landscapes. They thrive amidst what appears to be barrenness. The Holy Spirit indicated that the white owl sits, sees, and is seen in the darkness. It is often isolated on the landscape yet symbolizes wisdom and understanding. I believe that a remnant within the church are like the white owl, seemingly isolated in the culture; yet are seen as a light in the darkness, thriving amidst cultural barrenness, and walking in the wisdom of God. To actively, passionately follow Jesus and walk in His kingdom in 2014 we will seem as isolated individuals, churches and ministries because of our contrast with the surrounding culture. 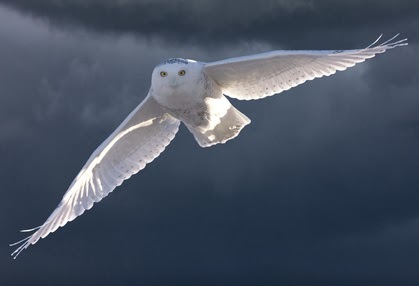 There will be joy, steadfastness, peace and victory as we do as the owl…see into the darkness to look past the natural or supernatural obstructions and proceed in wisdom and understanding.